“Walter Godefroot is the only one of my adversaries who I never beat in a direct fight for victory”. These words spoken by none other than Eddy Merckx clearly illustrate where Godefroot belongs in the history of bike racing. From 1965 until his retirement from racing in 1979 Godefroot amassed 155 professional victories. Before turning pro he claimed 131 amateur victories. Although a specialist in one-day classics, Godefroot was like many of his talented contemporaries and could shine in most disciplines including Grand Tours and track racing. His ten classics victories included three of the ‘five monuments' (Liege-Bastogne-Liege – 1967, Paris-Roubaix – 1969 and Tour of Flanders – 1968 and 1978). In the Grand Tours he claimed 10 Tour de France stage victories, one Giro stage, two Vuelta stages and three Tour de Suisse stages. 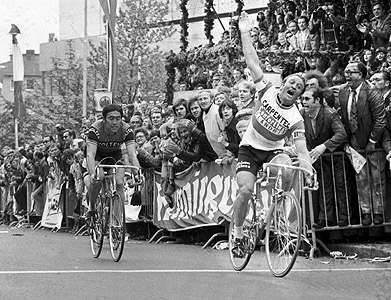 Of these the final stage of the 1975 TdF is the most historic as he was the first rider to win on the Champs-Élysées. In 1970 he won the Green Points Jersey of the TdF. Born in Ghent in July 1943, Godefroot epitomises the definition of a flahute. His stocky stature is enhanced by his ‘boxers nose' and like so many Flandrians he was weaned over the cobbles of Flanders and constantly buffeted by the raw weather that blows in from the North Sea . He originally wanted to be a gymnast but for a young athlete growing up in bike crazy Belgium life on the road was predestined (against his will). His generation of Belgian cyclists was rich in names that have become legends of the sport. Naturally at the top of the list is Eddy Merckx but there was also Roger de Vlaeminck, Freddy Maertens, Herman Van Springel and Patrick Sercu. From outside of Belgium Jacques Anquetil, Raymond Poulidor, Felice Gimondi, Jan Janssen and many other famous names filled the start sheets of Walter's races. The low profile of Godefroot's retirement is very much in accord with his somewhat dour and retiring nature where he makes little of his own achievments. As a racer he did not particularly love the sport and for him training was a necessary evil. In one Tour of Flanders he was in a winning position when a flat tire on the Muur de Grammont put him out of contention. He rode on alone to the finish and then two hours later was happily at home in his living room watching a TV program as though nothing much had happened that day. While not a sentimental man he could push himself to incredible lengths. In fact he could dig so deep that he was known to vomit after some of his efforts As an example the Liege-Bastogne-Liege was absolutely not a race suited to his talents yet he won it once and finished five times in the top five. Naturally to succeed as Godefroot did, he needed to have a firece competitive streak. Illustrating this is his fabulous 1970 Tour de France. While on the way to winning the Green Points Jersey he featured amongst the leaders in many of the major mountain stages. At that time Merckx was ‘King' but it is with a mischievous and somewhat proud memory that Godefroot recalls sprinting for a stage victory against Merckx and Lucien Van Impe at a mountain top finish. It still amuses him that as a flat-land sprinter he was able to match the very best in the rarified air of the Alps and Pyrenees . As Godefroot and his generation started to assert their place in the racing world Belgium was sadly seeing the end of two illustrious careers. Rik Van Steenbergen (Rik I) and Rik Van Looy (Rik II). In his very first year as a pro (1965) Godefroot won the Belgian Road Race Championship and that year he recalls riding a criterium with Van Steenbergen. He remembers being amazed at the adoration heaped on Van Steenbergen by the public. This experience obviously left an indelible memory and the less than effusive Godefroot has nothing but praise for “this man for the public”. Enhancing the legend is the stories from six-day races where Van Steenbergen would still be on the track at four in the morning because the public would not leave. Rik I retired in 1966. In 1967 I was in Ghent and saw a criterium that included both Van Looy and Godefroot. Van Looy, like Van Steenbergen was idolized by the Belgian public. To be amongst them when a race was on was absolutely electric and Van Looy would not disappoint. An intensly proud champion, he had at his services the famous ‘red guard' which was a team totally dedicated to their master. I cannot recal how Godefroot fared that day but I do remember seeing Van Looy deliver one of his killer sprints to win the race and send the crowd into an absolute frenzy. Rik II retired in 1968. It was in these times that Godefroot, Merckx and many more great champions started to emerge. At that time I was also making my own modest attempt to earn a living from racing in Belgium . I remember very well a conversation that I had with some fans in 1967 who, like most Belgians, are very knowledgable about the sport. The cycling fans bemoaned the loss of those great pre- and post-war years and were convinced that Belgian cycling was rapidly in decline because those great champions of the past could never be replaced. They were convinced that the sports future for Belgium lay with soccer. As it turned out we were living through a transitional phase. Godefroot, Merckx and their generation were moving into high gear. Merckx of course went on to win just about everything and anything called a pro bike race. It was Merckx who finally broke the 30-year drought of Belgian Tour de France wins in 1969 when he won (totally dominated) all three major classifications at his first attempt. Godefroot and his colleagues fumed at Merckxs' dominance and their love-hate relationship with Merckx fuelled fantastic racing and once more elevated Belgium 's cycle racing to the forefront with the sports fans. This phenomonem of the rise and fall of Belgian cycling is discussed in Belgian Cycles. In looking at Godefroot's results it is interesting to see how many times he took out Merckx and without doubt with obvious satisfaction. Having butted heads many times as amateurs they both entered the pro ranks in 1965 and that year Godefroot took the upper hand by winning the Belgian Professional Road race Championship from Merckx. At this championship the two of them clearly announced their arrival at the top of Belgian cycling. The next major victory for Godefroot over Merckx was when he won the 1967 Liege-Bastogne-Liege from Merckx (Merckx went on to win the L-B-L five times). In 1969 Godefroot rode a spectacular Paris-Roubaix and beat Merckx into second place by 2:39 minutes ( see part II of this article ). The following year (1970) Godefroot again bettered Merckx by one place when he came in second to Eric Leman in the Tour of Flanders. That summer Godefroot won the Green Points Jersey from Merckx at the TdF. 1974 saw one of the final demonstrations in the Godefroot Merckx saga when Godefroot took out a clear sprint victory from his long standing adversary at the Rund um den Henninger Turm. With his racing career entering it's autumn years Godefroot was still producing incredible rides. In 1976 he won the 560km (350mls) Bordeaux-Paris (he had won this race in 1969). This race, which is now sadly defunct, came straight out of the heroic era of cycling. Typically starting at 2AM in the morning, a small field would ride about halfway to Paris before joining up with pacing ‘Dernys' at Chatellerault. From there the real race would head for Paris which would be reached about 14 hours after the start. The most decisive battle of all would usually take place on the long grind up the Dourdan Hill leading into the Parisian suburbs. The 1976 victory was interesting in that Godefroot interrupted a string of seven victories made by his compatriot Herman Van Springel. The final great victory came in the 1978 Tour of Flanders. 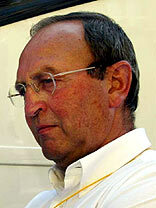 After retiring Godefroot took jobs as the team director for various teams before finally settling down at T-Mobile in 1992. He steered Jan Ullrich and Bjarne Riis to Tour victories while his other riders including Erik Zabel, Steffan Weseman, Udo Bolts and Rolf Aldag forged their own successful paths for the team. The final years at T-Mobile were often punctuated by very public struggles between him and Ullrich and his unsavoury personal trainer Rudy Pevenage. Finally Godefroot stepped down in 2005 saying “that after all these years at the highest level of the sport I now need tranquility and peace”. Barely one year later we learn that Alex Vinokourov (one of his former T-Mobile charges) has convinced him to manage the Astana team in 2007. Vinokourov greatly admires and respects Godefroot, as do his legions of fans.